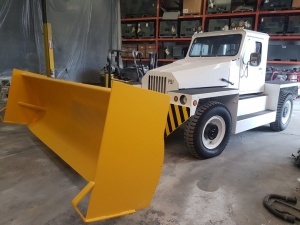 Check out our inventory of Snow Removal Equipment. The NMC- Wollard MB-4 Aircraft Tug/ Snow Plow Truck is a highly versatile tow vehicle offering 2 and 4 wheeled drive with various steer modes. With its 175,000-pound towing capacity this tug will pull most narrowbody aircraft up to and including all Boeing 737 series and Airbus A320 series aircraft. The MB-4 also comes equipped with a 12-foot plow blade for the removal of snow. Previous owner upgrades include a cd player, speaker/ sub-woofer, and LED lighting.